Since 2016, the media has been reporting that Metro ridership is declining. But how bad is the problem and what is causing it? A report out this week takes a hard look at the data. Falling Transit Ridership: California and Southern California was commissioned by the six-county Southern California Association of Governments (SCAG). The 70-page report comes from UCLA Institute for Transportation Studies authors Michael Manville, Brian D. Taylor, and Evelyn Blumenberg. While the diagnosis is far from conclusive, and nearly no prescriptions are offered, the report attributes the Southern California region’s falling ridership to increases in car ownership, especially among folks who have historically tended to ride transit: low-income immigrants, especially Latinos. Note that the report primarily focuses on the six-county SCAG region, which includes Imperial, Los Angeles, Orange, Riverside, San Bernardino, and Ventura Counties. The report focuses primarily on 2000 through 2015-16. During this period, in per capita terms, Southern California transit ridership was relatively flat until 2007, then began to trend down. In absolute numbers, ridership began trending downward in 2012. 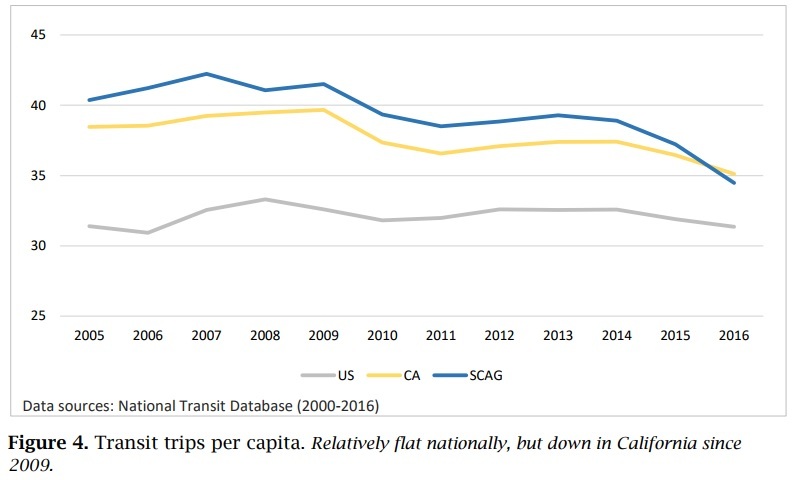 On a per capita basis, Southern California ridership has been trending downward since 2007; California ridership has trended downward since 2009. The report makes some comparisons between different California regions. 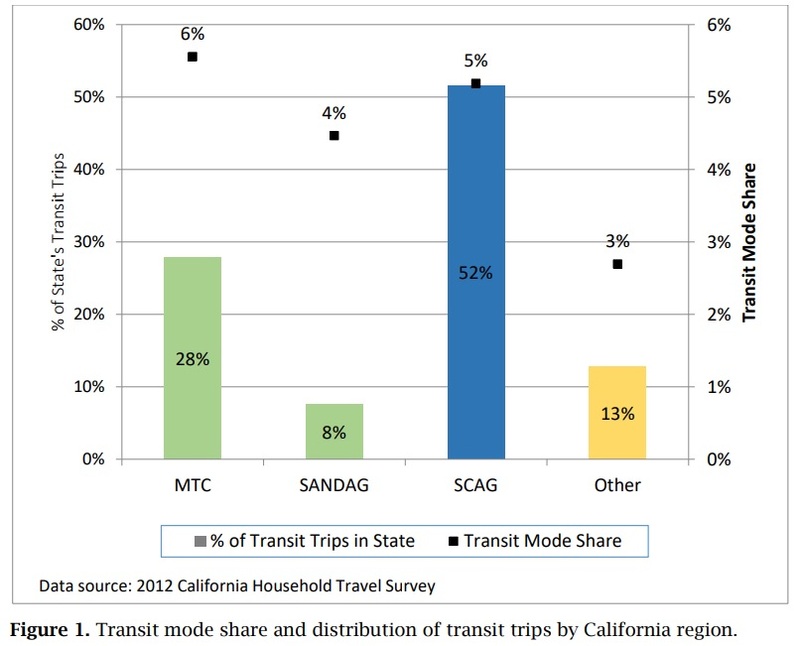 Statewide, the Bay Area sees a higher transit mode share (6 percent) than SCAG (5 percent), though, with more of the state’s population, SCAG is home to more transit trips (52 percent of CA’s transit trips). From 2000 to 2016, the Bay Area and San Diego area saw modest increases in transit ridership. California ridership was down due to declines in L.A. and Orange Counties. The researchers found that the larger changes were concentrated among a small group of people and in a small number of places. From 2012 to 2016 in California, annual transit boardings fell by 62.2 million. During that time, the SCAG region lost 72 million annual rides – 120 percent of the state total. In 2012, 82 percent of SCAG transit trips were in L.A. County. Further, Metro accounts for most of SCAG transit trips, and a dozen of Metro’s ~100 transit routes accounted for 53 percent of Metro’s 2012-2016 ridership losses. 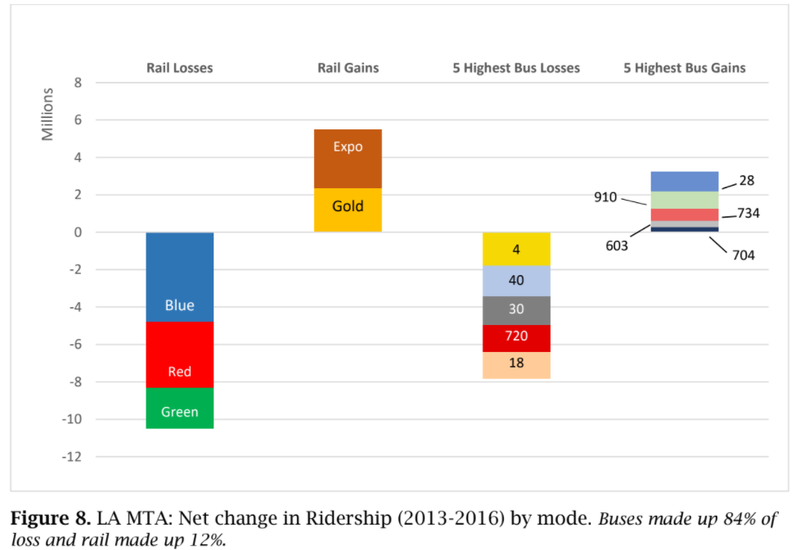 [For Metro] transit service supply has tended to follow, rather than lead, changes in ridership — at least through 2014. Beginning in 2014, bus service rose slightly while boardings plunged. Rail service, not surprisingly, has increased more than 150 percent since 2000, and ridership has increased as well, though more slowly. Both service and patronage have tailed off since 2014, but largely in concert— there is no obvious sign of one leading the other. [Metro] data offer little evidence that service cuts are driving away customers. Instead service expansion has been accompanied by less ridership, with the main result being lost productivity, particularly for rapidly expanding rail and van services. The researchers also looked at service quality: speed, reliability, and experience. Speedwise, SCAG regional buses have slowed over time, likely due to “many factors, including worsening congestion, shifts from faster suburban to slower urban service, shorter stop spacing, and longer stop dwell times to load and unload passengers.” Further “Region-wide bus vehicle speeds declined five percent between 2000 and 2010, and another eight percent between 2010 and 2016, for a total drop in speed of nearly 13 percent over 16 years.” This could be part of a deteriorating spiral, where the slower buses go, the more riders shift to cars (see below), worsening congestion, and causing buses to go even slower. Reliability and rider experience may influence ridership, but the report’s analysis was less conclusive. While Metro reliability appeared to improve, researchers could not “determine if Metro’s schedule adherence improved because its buses met the existing schedule more often, or because schedules themselves were changed.” Rider experience can be somewhat subjective, influenced by perceptions of safety. 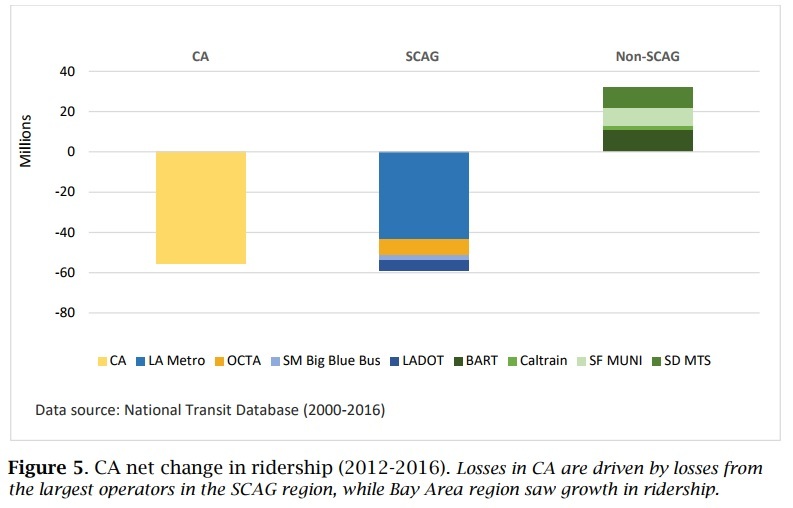 Fares play some role in ridership, though the report found little influence as, adjusted for inflation, SCAG region per-mile fares largely remained “remarkably flat.” OCTA fares rose somewhat. Big Blue Bus and Foothill Transit fares rose slightly. Inflation meant Long Beach Transit and Metro fares effectively fell slightly, despite Metro’s 2014 fare increase. While a number of factors – gas prices, ride-hail, gentrification – likely play some smaller role in declining ridership, the report finds that vehicle ownership fairly clearly plays a large role in declining transit ridership. There has been speculation that the rise of ride-hail Transportation Network Companies (TNC, ie: Lyft and Uber) may be siphoning off transit ridership. The report asserts that, though evidence is somewhat sparse, TNCs do not appear to be a major factor in declining transit ridership. Among the reasons cited are the timing: TNC ridership was minimal until 2012, while per capita transit ridership has declined since 2007. Between 2000 and 2015, vehicle access in the SCAG region became much more common. Households in the SCAG region, and especially lower-income households, dramatically increased their levels of vehicle ownership. Census summary file data show that from 2000 to 2015, the SCAG region added 2.3 million people and 2.1 million household vehicles (or 0.95 vehicles per new resident). To put that growth in perspective, from 1990 to 2000 the region added 1.8 million people but only 456,000 household vehicles (0.25 vehicles per new resident). The growth of household vehicles in the last 15 years has been astonishing. Across the entire SCAG region, the share of households without vehicles fell 30 percent between 2000 and 2015, while the share of households with a vehicle deficit fell 14 percent. Among foreign-born households, these percent declines were larger — 42 percent and 22 percent — and among the foreign born from Mexico they were larger still. Among the foreign born from Mexico, the share of households without vehicles fell by two-thirds between 2000 and 2015, and the share with a vehicle deficit fell 28 percent. Thus car ownership rose across-the-board, but rose fastest among subgroups with a high propensity to ride transit. And these changes largely occurred between 2000 and 2010, which aligns with the timing of the transit downturn that began in 2007. Car loans became easier during this time: “automobile credit also surged in the run-up to the Great Recession. And unlike home lending, which tightened considerably after the crash, automobile lending has remained relatively loose. […] Subprime auto loans also remain prevalent, allowing consumers with poor credit histories or low incomes to finance vehicle purchases. Where Does Southern California Transit Go From Here? The advantages of automobile access, which are particularly large for low-income people with limited mobility, suggest that transit agencies should not respond to falling ridership by trying to win back former riders who now travel by auto. A better approach may be to convince the vast majority of people who rarely or never use transit to begin riding occasionally instead of driving. This task is unquestionably more difficult than serving frequent-riding transit dependents, and it would likely require weakening or removing some of the state’s and region’s entrenched subsidies for motor vehicle use. One key takeaway is that “transit is unlikely to grow substantially, to accomplish its environmental goals, if driving remains artificially inexpensive.” There is a myriad of “entrenched subsides” that shift driver costs to the general public. These include sales taxes and general funds covering road transportation budgets, and parking requirements that bundle parking costs into rent, property, and product costs paid by everyone. As SBLA has reported, even when Metro is building multi-billion-dollar subways, Metro continues to invest similar multi-billion-dollar amounts in highway widening. This is true under both Measure R and M sales taxes. The current investment builds on top of decades of U.S. transportation spending that has, by more than an order of magnitude, heavily favored cars over transit. If public policies heavily subsidize driving, should it come as a surprise that people, including low-income folks and recent immigrants, are choosing to drive? Metro cannot be expected to stem the broad national tide of pro-car investment, but what can the agency do that is more-or-less within its purview? Some cities, including Houston and Seattle, have seen ridership gains after reorganizing their bus networks. After setting aside its 2016 bus service reorganization plan, Metro is just getting underway on another similar effort. Last November, the Metro board approved a $1.3 million contract for the Systemwide Bus Network Restructuring Plan. In a press interview, the UCLA ITS authors encouraged Metro that reorganizing bus service is “still worth it,” but offered a caveat that, given the study’s findings of the suburbanization of the SCAG region’s housing and jobs, that the “payoff may not be as high now.” Brian D. Taylor spoke of how, in the past, concentrating frequent bus service on core trunk lines (generally at the expense of outer, more suburban areas) was a proven strategy for increasing ridership. Taylor encouraged Metro to proceed with the effort but did not expect it to be a silver bullet. As Metro Boardmember Mike Bonin pointed out, the agency’s new bus advertising revenue can pay for increasing and improving bus service. Even though some media point to “free-falling” ridership that is in a “slump,” Metro’s bus and rail still deliver more than 1.2 million passenger rides on a typical weekday. The UCLA ITS report quantifies a decline that appears to be spiraling. It is up to Metro leadership to take ridership, and especially the bus system, more seriously. The Metro board can use the new study to create urgency to speed improvements to ensure effective transit service that serves mobility, equity, health, and the future of the region. Streetsblog needs to change the way large block quotes of text are formatted. The light gray is almost unreadable. You’re right. It’s been an issue since our facelift, and one we, as yet, don’t have control over. There’s also no good interim solution at present – bolding them can give quotes an emphasis that they’re not necessarily meant to have. We’ll keep working on it. Thanks. And the first step to doing that is to get people to take their dirty shoes off of the seats so professionals in work attire can use the seats. People don’t feel safe on public transit. Metro is on the right track with having uniformed police riding. They need to do something about LAPD officers in particular acting thuggish from time to time, but their presence may be helpful in the long run. If you have administrative access to a WordPress site, it is fairly easy to make a modificarion to the CSS and thereby change the font color, etc. for blockquoted text. As SBLA has reported, even when Metro is building multi-billion-dollar subways, Metro continues to invest similar multi-billion-dollar amounts in highway widening. These statements here are the crux of the issue. Outside of LA County, transit really isn’t that great. As people have been priced out of LA, they find themselves in places like Highgrove while still needing to commute to work somewhere in LA or Orange counties. In many instances, the most realistic option is to drive, and it becomes even clearer when considering travel to the types of jobs now dominating in the IE, namely logistics. Additionally, most of the rest of the SCAG region puts the lion’s share of any local transportation measure dollars (if they have one, as I believe Imperial and Ventura counties do not) toward road projects while in comparison, the commitment to transit is weak and sometimes even held hostage by the road projects. As a result, transit is lackluster, especially outside of LA, and despite the crushing commutes on the freeways, they’re still comparatively better than transit because that’s how bad the transit is. deserve a costly road network and a costly transit system as well. Because the periphery is where the people who are getting priced out of LA are landing. However, you do have a point. A significant portion of the issue is that LA is wringing its hands over something that it does have some control over. Most obvious is that LA could spend less money on road “improvement” projects. Making it easier to drive means that people will continue to pick that over transit when they can. Biking in LA is also still a crapshoot with much emphasis on the “crap” part. Even recent projects are lackluster. Then, there are the issues of restricted development around the little transit expansions that have occurred. Lift all those and the picture gets much better. Italics, with underlining for emphasis. Looking at these stats makes me feel like all the rail work being done now is to aid the real estate bubble. If the most expensive housing in the city is all near transit, and Metro is mostly ridden by the poor how will these billions of dollars in investments look in 50 years? Sure the Olympics will be fun…. Immigrants and other working people understand that cars can expand their job search to a a wider area and then make commuting to a job easier than on public transportation. The booming economy makes more jobs available and easy financing makes it possible for working people to buy cars and low gas prices make them cheaper to operate. Yes, I remember the story of the groper on the bus who was arrested in LA, the smell of pot and the lowlifes and crazies who are the only ones insane to take the bus. I also remember the rats and not feeling safe at 7:00 pm waiting for a Silver Line bus which only arrived once every half an hour. I had a six figure job in LA and my company agreed to pay for public transportation so I suffered through it. So there is the solution. Free public transportation during peak hours and an efficient fast system that results in the city being penalised by the State for not keeping the Metro on time. I think it will seem safer once the number of work commuters out number the number of parolees on their way to see the public defenders taking the bus or train.